weekend in sharon, originally uploaded by jahansell. What are all those people looking at? 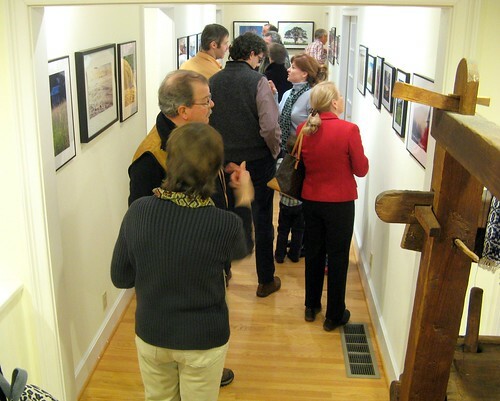 Why, it's a show of Sharon Daily Photo, now on display at the Sharon Historical Society! What an amazing day! There must have been 75 people who came - (the free-flowing wine and yummy snacks helped lure them, I"m sure. I had printed up greeting cards, and had matted photos in a basket, great little half-sized business cards, and the best 28 or so of the over 600 photos I've posted here in the last two years. And now back to our regularly scheduled blog: starting tomorrow I'll stop going on and on about the show and get back to showing off Sharon, CT in all its (currently) wintry beauty. I just wanted to bask a little longer! Surprised? You shouldn't be! I looked for a link to purchase some cards/prints alongside in you links etc, but didn't see any. I hope you're planning to . . . It WAS lots of fun. I enjoyed the art and the crowd of cool people. I think you should market Sharon CT notecards- starting with the neon pavement picture! Glad it went well! Congratulations! Wish I could have been there! Congratulations. This is a well deserved honor and one I hope several other Daily Photo bloggers repeat. That is wonderful Jenny! I am so thrilled to see your show "in action!" I am catching up on all your wonderful photos now that you are back.